Watching the news coverage and seeing so many social media postings of Pope Francis’ visit to the United States this week, I am remembering the first time I saw the pope. It was Pope John Paul II, twenty years ago, when he visited New York in October, 1995, and said mass at the Great Lawn in Central Park. Surprisingly, I found a picture of my friends that attended the mass and the altar where Pope John Paul II celebrated the mass. 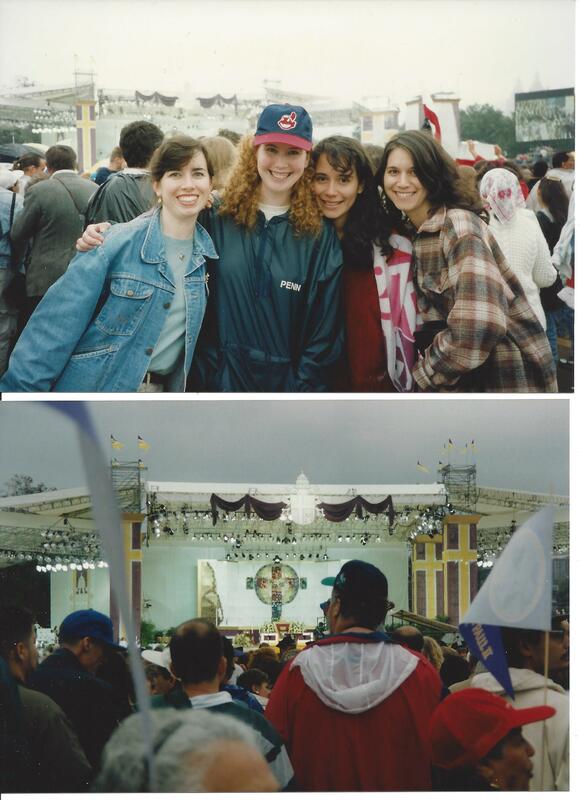 My friend Nora was able to secure tickets to attend – not an easy task as everyone wanted see the pope – and I was so honored and grateful that she invited me to join her and her friends Christine and Jen. I wonder now if the big guy she’s referring to is the man in the red jacket and baseball cap in my picture up above. I have one other photo of the altar, and he is squarely in front of it, blocking the view. I do remember the distributing of the body of Christ – how we were all in sections on the lawn and priests came to each section and the whole process went much more quickly and orderly than I imagined it would. I also remember it being a joyous feeling. Everyone was peaceful and happy. “Yesterday morning as the skies lightened, the music began. Roberta Flack sang “Amazing Grace.” Natalie Cole appeared with the Boys Choir of Harlem. Placido Domingo sang during Communion. Latino pop singer Jon Secada followed Kathy Triccoli, a Christian pop star. I also found this video on YouTube, shared by John Saffire, at the start of Mass with the Ode to Joy playing. It is hard to put into words what being in the presence of the Holy Father feels like, but watching Pope Francis on television, my heart is filled with love, and I can not help but tear at the grace, beauty and joy that you can see in everyone’s faces. I hope that everyone that sees Pope Francis during his visit, either in person or on television, remembers it for many years to come. This entry was posted in New York City, United States and tagged Catholic, Central Park, John Paul II, Pope by Kiera Reilly. Bookmark the permalink.